At first sight this model appears to be simply a black Beomaster 1200. The important differences were that the Beomaster 1001 does not include an AM radio section. This was removed to make way for the two control keys for the ambiophonic four channel loudspeaker arrangement, the other major difference between the two models. The purpose of the Ambiophonic function was an attempt to add an extra dimension to stereophonic recordings. The normal two left and right loudspeakers would be positioned normally in front of the listener, and two additional (and possibly slightly smaller) loudspeakers would be positioned some way behind the listening position. The rear loudspeakers were connected so as that they both only responded to the difference between the left and right channels, and a filter could be switched in so that they only responded to lower frequencies. Should ambiophonic reproduction not be required, the sockets could be used instead to drive a second pair of loudspeakers in a second room. Text copyright © Beocentral. Unauthorised reproduction prohibited. The new model could be quickly identified by its black anodised control keys and tuning scale. Though many detail changes had been made, one thing that did remain was the split volume controls, though the Beomaster 1001 would be the last model B&O to be fitted with them. Whether the sacrifice of the AM bands was worth it for the Ambiophonic functions (especially as B&O offered an Ambiophonic adaptor for use with the other models anyway) is debatable, and the system faded from the range a few years later. 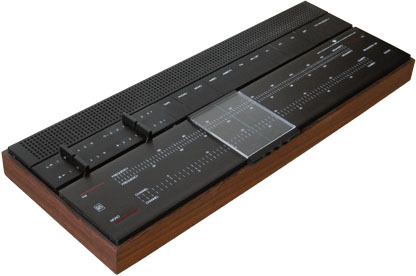 The Beomaster 1001 was the last model of its type too, but the basic form continued on with the larger and more powerful Beomaster 2000 and the genuinely quadraphonic Beomaster 3400. Text copyright © Beocentral. Unauthorised reproduction prohibited.